Displayco has been providing creative exhibit and display solutions since 1978. 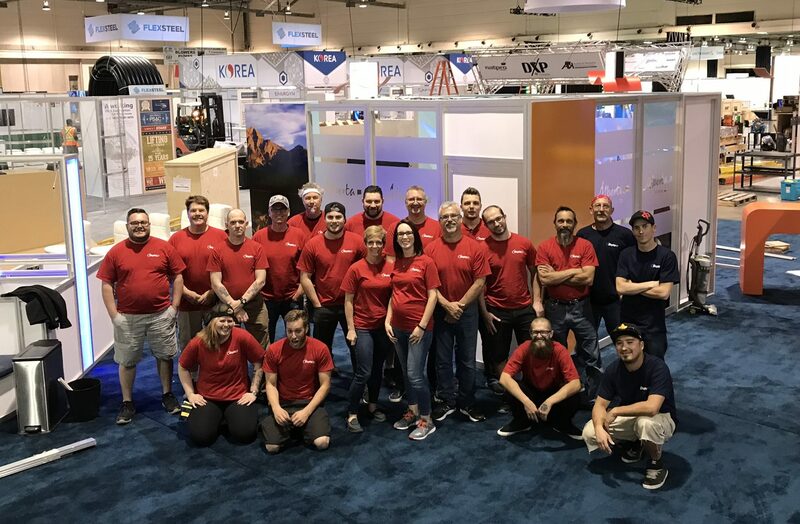 Over the past 40+ years Displayco has evolved from a small screen-printing and signage company into one of North America’s premier exhibit and sales environment companies. Displayco specializes in business-to-business tradeshows and point of sales promotions. With the addition of Derrick Exhibit and Wynne Exhibit to the Displayco team in the past years we are expanding to create one of the largest and most experienced companies in the markets we serve. With many years of combined experience, Displayco has designed, built and installed displays for trade shows, lobbies and corporate special events. Our Management objective is to consistently deliver a product or service that exceeds our customer expectations. Our designers utilize today’s technologies to provide creative, visually appealing exhibit solutions. Displayco’s team has successfully delivered hundreds of exhibit and display programs for customers from a variety of industries, in as far away places as China, Germany & Brazil. Displayco is proud to be recognized as an International Octanorm Service Partner (OSPI); providing us a worldwide network of strategic partners in the exhibit service industry. Through leadership, creativity and excellence Displayco will focus on meeting and exceeding customers’ expectations.